What role should racial difference play in the American workplace? As a nation, we rely on civil rights law to address this question, and the monumental Civil Rights Act of 1964 seemingly answered it: race must not be a factor in workplace decisions. 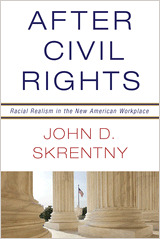 In After Civil Rights, John Skrentny contends that after decades of mass immigration, many employers, Democratic and Republican political leaders, and advocates have adopted a new strategy to manage race and work. Race is now relevant not only in negative cases of discrimination, but in more positive ways as well. In today’s workplace, employers routinely practice “racial realism,” where they view race as real–as a job qualification. Many believe employee racial differences, and sometimes immigrant status, correspond to unique abilities or evoke desirable reactions from clients or citizens. They also see racial diversity as a way to increase workplace dynamism. The problem is that when employers see race as useful for organizational effectiveness, they are often in violation of civil rights law.